Our home in Tuscany, the Villa Montecastello, has not only opened its doors for guests interested in exploring the wine and foods around the region, but also offers warm evening gatherings, incredible meals and beautiful, comfortable overnight accommodations. For these purposes a house wine was needed. We all love to enjoy Brunello and Barolo, but we don’t want to drink BIG every night. Fun summertime activities and long outdoor meals often call for a fine wine that is easy, true to its core and available without limits. No competition, no sophistication, we seek out the best of our local grapes to make a red and white wine that is a pure pleasure to drink in every way. Introducing Villa Montecastello Pinot Grigio delle Venezia IGT and Chianti DOCG. Our white wine is a Pinot Grigio produced at the important viticultural Domaine of Forchir Vinyards located just below the Friulian pre-Alps. From three different vineyard lots, with the main location spread over 100 hectares in one single piece of the gravel drenched soil closest to the Alps. These vineyards are exclusively composed of fist size pebbles and bigger stones left behind as the end moraine of a glacier which pushed down from the Alps several million years ago. Here, and only here, true mineral driven Pinot Grigio of Italy can be produced that distinguishes itself from what this grape cannot produce elsewhere. Our red wine is a Chianti made on the vineyards of our trusted friends at Rocca di Castagnoli, a short drive from Villa Montecastello. 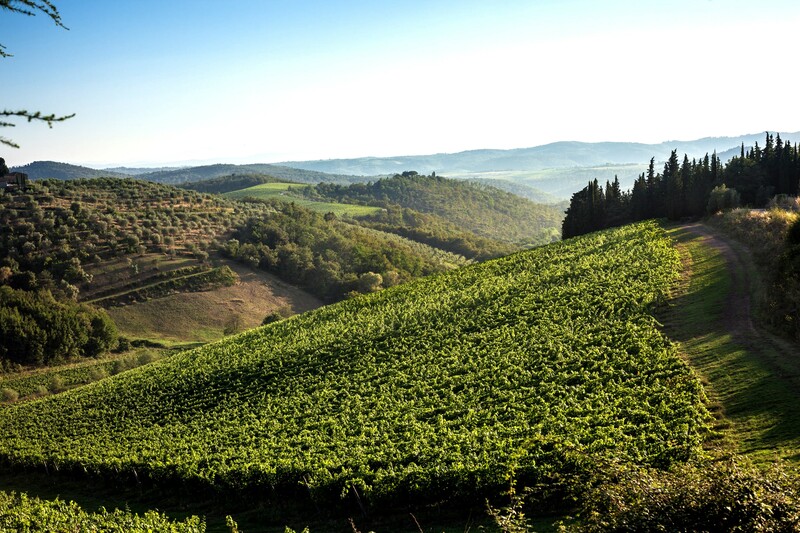 In the pure air of the highest altitude vineyards of the Chianti hills, these organically grown (still in conversion) Sangiovese grapes yield a trademark impression of red fruit, depth and freshness that made these hills so famous. This is our quintessential Chianti, our liquid food on the table. Never too heavy, but with the depth and finesse of an elegant wine. For complete technical information click here.